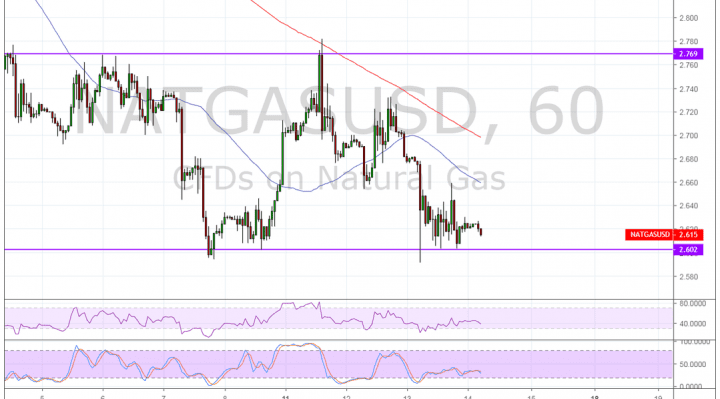 Natural gas has fallen back to its lows around the $2.600 level as bearish momentum remains in play. The 200 SMA held as dynamic resistance and the drop back below the 100 SMA confirms that sellers aren’t done. The moving averages almost made a bullish crossover, but the failure to complete such also indicates that bears are refusing to let up. This could signal that support is more likely to break than to hold. If so, price could fall by the same height as the range, which spans $2.600 to $2.770. RSI is turning lower to confirm that selling pressure is returning. The oscillator was previously heading up to show that buyers are in control but changed its mind halfway through. The same goes for stochastic that turned lower once more, indicating that bearish pressure is still in play. Another round of forecasts for milder temperatures spurred weaker demand outlook for natural gas. US weather models predicted a milder end to February, and moved more in line with European forecasts that had already caught onto the less intimidating cold, all in all spelling weaker demand and a potential overstock as spring rolls in. Meanwhile, it’s full speed ahead for US natural gas exports as the latest Department of Energy data indicated that LNG exports hit a record of nearly 110 Bcf in November 2018, a 35% gain from the previous year. Analysts predict that US natural gas production could be poised for the biggest year ever, which could keep global oversupply concerns in place. Also trade tensions are weighing on overall market sentiment these days, which is also another bearish factor for commodities like natural gas. Any indication that the US might impose more sanctions on China increases the risk of retaliatory measures that wind up hurting overall global demand.